The 14th Armored Division landed at Marseilles, France, 29 October 1944. On 12 November, Headquarters, Combat Command R was ordered to Nice. The 19th and 68th Armored Infantry Battalions were attached to CCR. The 19th AIB moved to the area of Nice on the 13th, with the 68th AIB following the next day. The two battalions were the first elements of the Division to enter combat, maintaining defensive positions in the Maritime Alps along the Franco-Italian frontier. Meanwhile the rest of the Division moved north to the area of Epinal. On 19 November, CCA joined Seventh Army's VI Corps in its drive through the Vosges Mountains. 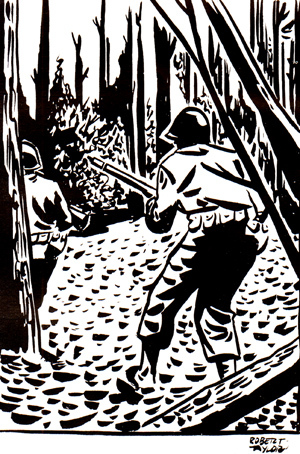 Hard fighting in and around the mountain towns of Gertwiller, Benfeld, and Barr cracked Nazi defenses, and the Division was on the Alsatian Plain early in December. The Division began assembling at Hochfelden on the Alsatian Plain to the east of Strasbourg on 1 December. By 11 December advance elements of the Division began movement across the Moder River into the Haguenau woods in preparation for an offensive to clear the Alsace of German forces. The Division began its attacks on 13 December and reached the German border along the Lauter River two days later. Led by troops the 19th AIB, the Division crossed the river into Germany in the area of Wissembourg. On the 17th they began to attack the Siegfried Line in force. Despite making good progress in breaching the German defensive line, the Division was ordered to withdraw into the Alsace on 19 December due to the major German offensive in the Ardennes. On Christmas Day Task Force Hudelson, a relatively small force without tank support, was formed around the Division's 62nd AIB and 94th Cavalry Squadron. The TF was assigned defensive positions in the mountainous area running south of Bitche in the area of Bannstein. On New Year's Eve, TF Hudelson received the first attacks of Operation Nordwind, the last major German offensive of the war. Engaged by elements of five German divisions the TF managed to delay the enemy advance long enough for strong reinforcements to arrive and contain the thrust. With the failure of this attack, the German command shifted its effort to the Alsatian Plain with the goal of breaking through Hagenau to reach Saverne and Strasbourg. This, the largest effort of Operation Nordwind nearly succeeded when attacks at Hatten and Rittershoffen on 9 January achieved a short-lived breakthrough of the Seventh Army lines. In a short, but furious armored engagement, elements of the 14th Armored Division stopped the breakthrough and restored the defensive line at the two villages. In the resulting Battle of Hatten-Rittershoffen, the 14th, supported by the 2nd and 3rd Bns., 315th Infantry, fought the German XXXIX Panzer Corps to a stand-still. The division's 11 day stand at Hatten-Rittershoffen gave the rest of Seventh Army time to withdraw to newly prepared defensive positions on the south bank of the Moder River. In the early morning hours of 21 January, the 14th finally received orders to disengage from the enemy and withdraw from Hatten-Rittershoffen. In the darkness the division, and its supporting units, moved south along miles treacherous, icy roads, and joined the rest of Seventh Army. While maintaining defensive positions along the Moder,the 14th reorganized, refitted, and trained its replacements during February and early March. 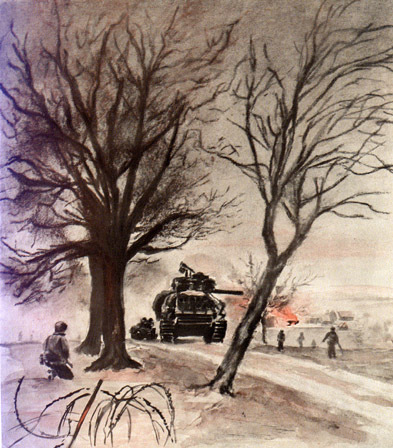 The Division resumed the offensive on 15 March 1945. It crossed the Moder River and retook the Alsatian territory given up during Operation Nordwind. The 14th crossed the Lauter River once again on the 19th of March and attacked the Siegfried Line the following day. By the 24th, the Division had captured Germersheim on the Rhine. 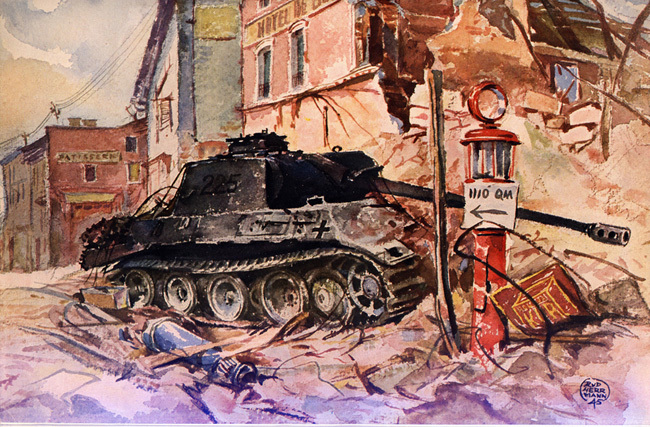 On Easter Sunday, 1 April 1945, the 14th moved across the Rhine on a pontoon bridge near Worms, and continued pursuit of the retreating enemy through Lohr, Gemunden, Neustadt, and Hammelburg. In its final thrust, the Division raced to the Danube, crossed at Ingolstadt, and pushed on across the Isar River to Moosburg, where over 110,000 Allied prisoners were liberated. Division artillery fired its last rounds of the war on 2 May 1945 in an action along the Inn River not far from the Austrian border. The 14th was busy processing German prisoners when the war in Europe finally came to an end on 8 May, 1945.